"It's either going to be an exciting success or an exciting failure -- one big boom." 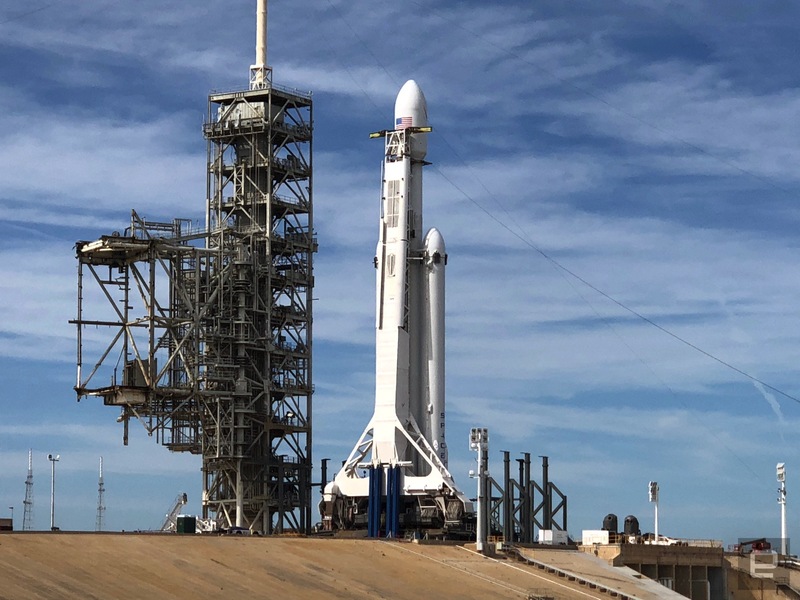 Tomorrow, SpaceX will attempt to launch its massive Falcon Heavy rocket for the very first time. If successful, it will be the most powerful rocket in operation and opens up the possibility of future crewed missions to the Moon or Mars. Today, Elon Musk gave a few more details about the launch attempt during a press call ahead of tomorrow's main event. Musk detailed the rocket's mission: After launch, it will coast for six hours, straight to geosynchronous Earth orbit, which is an orbit that follows the Earth's rotation so a satellite stays in the same place. This phase of the mission is specifically related to national security missions, to show that the rocket can deliver a payload directly to GEO. After this, the rocket will begin a trans-Mars injection engine burn. The upper stage of the Falcon Heavy will position itself in an elliptical orbit -- one part will be in Earth orbit, and the other will be in Mars. Musk described it as an "Earth-Mars cycler," but it's a little tricky to imagine just what this orbit will look like without some visuals. If everything goes well, the rocket will be about 400 million kilometers (about 250 million miles) away from our planet, and will remain in that orbit for up to a billion years. There's an "extremely tiny" chance it (along with the Tesla roadster that the Falcon Heavy will carry) could even impact the red planet. But there is a lot of risk associated with tomorrow's mission, and Musk was frank about it. "It'll be a real huge downer if it blows up," he said on the call. If it explodes on the pad, the damage will take 9-12 month to clean up. However, an unsuccessful launch will not impact production. Even if the rocket takes off, there's a lot of uncertainty in its risky mission. It will travel through the Van Allen Belts, charged areas of trapped radiation that surround the Earth, which could damage the rocket. There's also the concern of ice on the upper stage, as well the possibility the fuel could freeze or the oxygen could vaporize. There are many unknowns when it comes to tomorrow's scheduled launch; but one thing that Musk promises is that it'll be exciting: "It's either going to be an exciting success or an exciting failure -- one big boom."